Alexious Shoko, from Piket-bo-berg, was crowned as the Western Cape’s Farm Worker of the Year for 2015 during the gala ceremony in November 2015 at the Nederburg Wine Estate in Paarl. Shoko is the assistant production manager at the Mouton’s Valley farm, where he has worked for the past seven years, and has been described as dedicated and a leader in his community. “It’s the most amazing feeling ever”, said Alex Shoko when describing his win. Shoko says he would not have been able to do this without the support of his wife Tabitha. “I’m very thankful to the Western Cape Department of Agriculture and Shoprite for acknowledging farm workers in this way. The magnitude of the competition is astounding and I would definitely encourage even more farm workers to enter next year”. Lien Visagie, winner of the Witzenberg regional competition, and Martha Januarie, winner of the Hex Valley regional competition, tied for second place. Visagie works at Donkerbos near Rietfontein and Januarie is an administrative assistant at Villion Farms, Boplaas. Cornel Paulse, the winner of the Franschhoek competition, was awarded third place. Paulse has been a Junior Manager at Glenwood Vineyards since 2011. The Farm Worker of the Year Competition is co-sponsored by the Western Cape Department of Agriculture and Shoprite, Africa’s largest retailer. Over 6000 agricultural employees have entered the competition since 2002. During the current competition, 1247 residents participated in the competition, a 20% increase compared to the previous year. Following a rigorous selection process, Shoko emerged as the entrant with the highest scores. As part of this process, entrants are scored on their overall knowledge of the agriculture sector and finance issues in the country and on-farm, which includes budgeting and costing. Entrants are assessed on topics such as Black Economic Empowerment and the export chain. Their experience and agricultural skills are also key criterion. Regional winners and runners-up received cash prizes and shopping vouchers from Shoprite. Shoko’s prize includes an overseas trip. “We have a role to play in the recognition and upliftment of farm workers. These individuals are the reason we’re able to sell quality produce in our supermarkets on a continuous basis”, commented Dr Johan van Deventer, General Manager at Freshmark/Shoprite. Alan Winde, Minister of Economic Opportunities, congratulated Shoko and thanked all the entrants for their contributions towards growing the agriculture sector. “Alexious represents the excellence our world-class agricultural sector is known for. His leadership qualities, dedication and insights into the sector’s key issues earned him the top award. Through their efforts and hard work, we are strengthening the Western Cape’s brand as a producer of high quality agricultural goods. I hope that all of the finalists are able to use the awards as a platform to further develop their agricultural skills and I wish them all the best”, said Minister Winde. 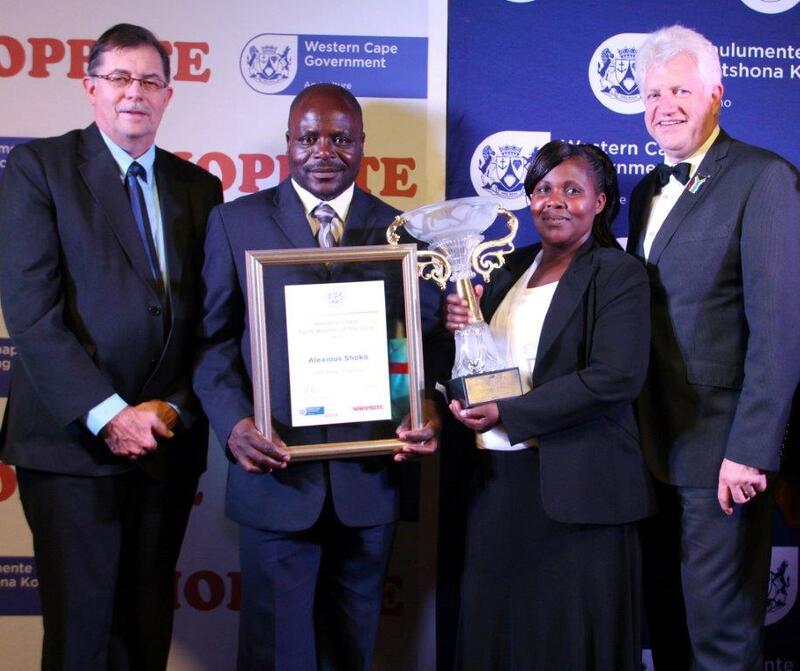 Shoko not only walked away with the much sought after honour of being the 2015 Western Cape’s Farm Worker of the Year, but also bagged some big prizes including an iPad Air sponsored by Daleen Turner Consultancy, a R20 000 Shoprite gift voucher, a R60 000 overseas study tour and R20 000 cash sponsored by the Western Cape Department of Agriculture. All the guests who attended the event also had an opportunity to vote for their preferred word which describes a farm worker as well as a new name for the competition. The word ‘Agri Worker’ was the favourite title, and it was concluded that in future the competition will officially be called the ‘Western Cape Prestige Agri Awards’.